Nowhere is this more elegantly exemplified than tracing back to the origins of this vibrant entrepreneur’s journey.Dr. Nawab Shafi Ul Mulk, the scion of the Royal family of Kurnool, could have rested on the wealth & glory of his ancestral heritage. Yet always one to take up challenges he preferred to draw his own individualistic mark by setting out an entirely novel game plan for himself untested by his predecessors. From his choice to take on the grueling and rigorous field of Medicine, which he entered as Top Indian merit student, to his success story as a Neuroradiologist, healthcare entrepreneur and a sportsman par excellence the ensuing legacy he has created for the future generations, this is an inspirational story truly worth being narrated. 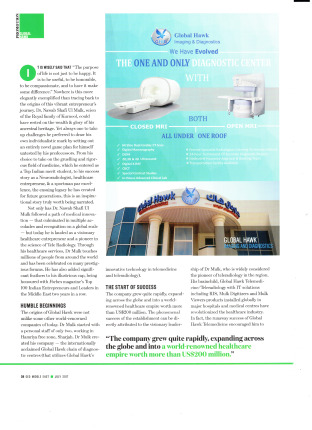 Not only has Dr. Nawab Shafi Ul Mulk followed a path of medical innovation- that culminated in multiple accolades and recognition on global scale – but today he is lauded as a visionary healthcare entrepreneur and a pioneer in the science of Tele-Radiology. The origin of Global Hawk was not unlike some other world-renowned companies of today. Dr. Mulk started with a personnel staff of only two, working in Hamriya free zone, Sharjah. Dr. Mulk created his company – the internationally acclaimed Global Hawk chain of diagnostic centers (that utilizes Global Hawk’s innovative technology in telemedicine and technology). In the region. His brainchild, Global Hawk Telemedicine/Teleradiology with IT Solutions including RIS, Mulk Digitizers, and Mulk Viewers products installed globally in major hospitals and medical centers have revolutionized the healthcare industry. In fact the runaway success of Global Hawk Telemedicine encouraged him to start the chain of GHID centers which eventually lead him to a number of accolades and international awards.